Our graphite blocks are used where lubrication is required. The high density graphite blocks are used in many different industries for lubrication purpose where the working temperature is high. 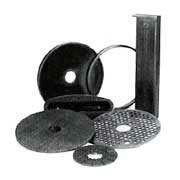 They are mainly used in cement industries in kiln machines. These industrial graphite blocks are also used in various chemical industries like copper, zinc, aluminum extrusions industries, glass, cables manufacturing units, paper mills etc. We make our graphite carbon blocks available in the best quality and that also at the industry leading prices. Today, we are regarded as one of the affluent electrode graphite blocks exporters from India as well as their established manufacturer.